Browse the idea gallery on the right, click on a page to make it bigger or even print it out. 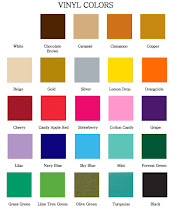 Choose your color(s) from the list on the right hand column. If you have a custom order, e-mail me your idea, size, and a few fonts you want to see it in at wordcandyvinyl@gmail.com . I will e-mail you back some samples and prices. Fonts are listed by clicking the link on the right hand column, or click here. e-mail me at www.wordcandyvinyl@gmail.com with your order details or any other questions that you might have.